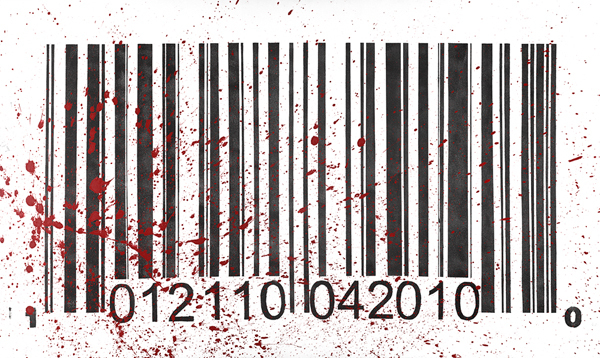 My barcode project was something I had been working on, conceptually, for over a year. It wasn’t until the events of 2010 that I started to imagine the shape and scale of the first painting and how I wanted it to seem to have a presence, (they all are very large, 3 feet by 6 feet long). Once it all came together, No. 1 was created rather quickly, almost violently. At that point, I felt the story was not over, and explored the shape further, in the rest that followed. The story is not over, however, and I am now working on No. 5, which will debut later this spring. I hope you enjoy these as much as I did making them. For my first painting, I wanted to express the numbers as dates. No. 1 deals specifically with the dates of the Citizens United vs. FCC Supreme Court case earlier in the year and the Deepwater Horizon Explosion that which started the Gulf Oil Spill, respectively. Looking at these two seemingly unrelated events, I started to learn more about how our government is influenced with corporate money and how it affects our nation’s ability to respond to disasters and to govern as a nation. In these two cases here, I felt that we have effectively sold our government offices in full view by giving corporations a vote in our politics while robbing their ability to respond to major crises. Thus, when these two events occurred, it became an assault on our democracy as we succumbed to a truly commerce driven society.